Pencil sketch and start of inking.shown. In my post The Making of a Scroll, Part 1, I briefly comment about roughing in the border with a 4H pencil then going over those lines with a permanent .005 Pigma Micron pen. I've been asked, wh I do that? When I start a scroll I research and develop a mental design concept. 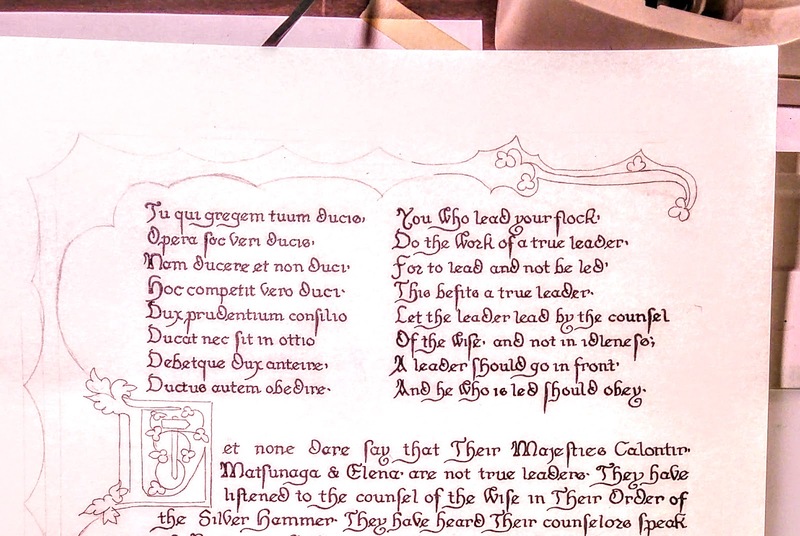 Sometimes I make a mock-up of my intended illumination as well as the calligraphy layout. Those are both tentative visual aids. Before I begin painting, but after the lettering, I use a 4H pencil to sketch my design. Referring back to my inspirations, planned motifs, and possible assignment requests I double check my expectations. Sometimes I make a change because I feel the spacing is unbalanced. Sometimes I make several changes. Prior to inking it's easy to erase with a white eraser, and redo it. You can see the difference between my two pictures. Once I'm sure I have what I want, I permanently ink over the pencil lines. I use the black Pigma Micron pen because it is permanent. Using a permanent ink keeps the outline from blurring as I apply the water-based paint. I use the very small .005 size, because it works better for tiny motifs. It also gives me options for my final outlining. Design change seen in upper left. 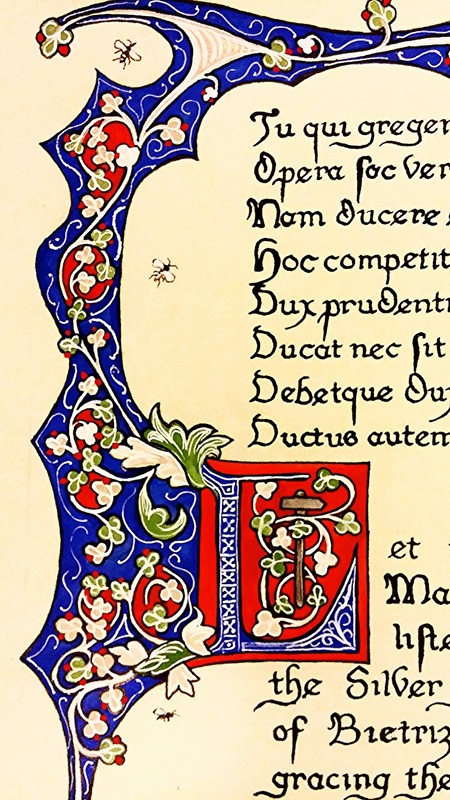 Earlier manuscripts had wider black outlines than later Medieval illuminations. The outlines may also vary by workshop. Using a narrow ball pen, I have the permanent line designed and will go over it with a wider ball pen, if indicated by the style. It's also possible to use a different color ink or a dip pen for the final outlining. If black edges in my resources are narrow I leave the design line as it is. In Renaissance styles, I may cover over the outline with paint, as they commonly show. After the ink is well dried, I use my trusty white eraser to remove all pencil lines carefully and well. This includes going over the lettering too. That gives a background surface as clean as I can make it. Besides removing obvious pencil lines, erasing also removes oils and dirt. Many times the next step is gilding. Removing surface oil cuts down on gold flecks attaching in unwanted places. Controlling outlying gold flecks gives you a cleaner looking finished scroll. 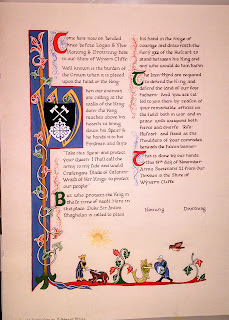 Attention to detail is important when creating a scroll. Clean, well thought out and neatly worked efforts make a treasured award. Permanent crisp, black motif outlines are the groundwork for you design. Iluminators were known to layer paints more than mix them. 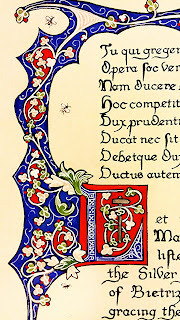 Yet there are written notes and illuminations that show they mixed colors too, especially later in the Middle Ages. Mixing colors makes its own problems. The more colors you combine, eventually ends with mud. Over-mixing also dulls the paint combination. 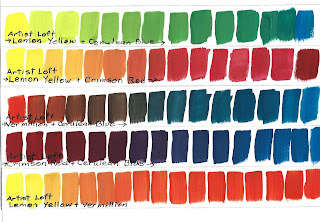 Which colors should you use for your primary paints? 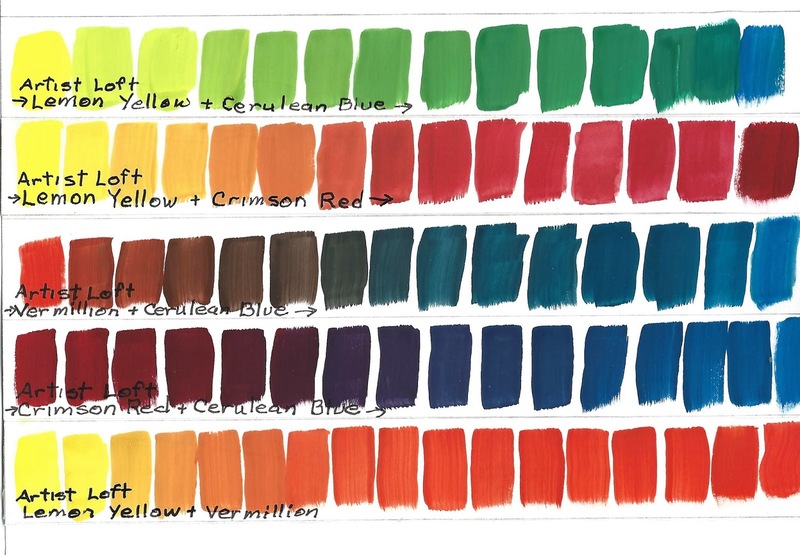 See how different these gouache mixtures appear when I use different paint colors to mix for my primary colors. I used Bristol board, Artist Loft paints, and a 10 broad flat brush. For each sample, I began with the lighter color on the left, added the color on the right end and expected to end with it. With a dab of the lighter color, I added a teeny-tiny paint amount of the color at the farthest right end. I blended the paints then stroked the Bristol board with the mixed color. Then I added another small amount of the farthest right color to my previous mix. I repeated this until I reached the color on the right, my darker color. I gradually mixed the paints and stroked them across the paper's space. Exploring your paints this way develops your mixology skills so you make the color combination you want every time. It also helps you learn in case your paint collection misses a tube color you want. 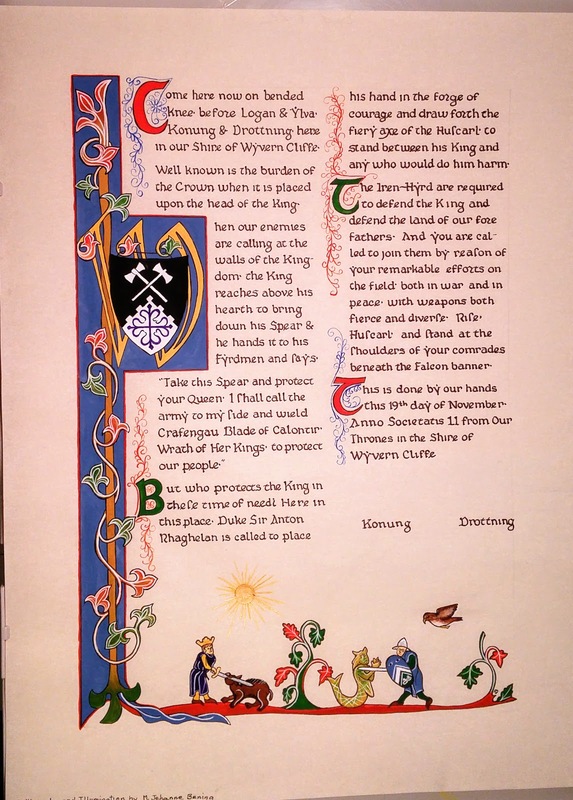 Down-load an illuminated manuscript picture and cut out a limited color swatch from one area. With the paints you own mix colors until placing your downloaded sample on top of your painted swatch seems to make it vanish into your mixed color. Keep a record. If your first attempt is not an exact match, keep playing with your paints. It may also take a different paint tube from the store to get it right. With perseverance, you'll be able to match any color you want. Soon you'll do this without thinking. If you are into color mixing, keep a journal. Make a swatch of each mixture you make. Note the paints and colors you used. Playing with colors is fun and expands your skills. You also become more color-ware. And you avoid making mud. 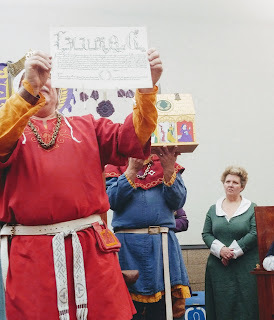 I was asked by a scribal friend last week how I would critique another scribe's scroll. In Calontir we often talk about this and how to do it. Critiquing another person's work is tricky because of the personal pride held by the sharer and the hearer. Some encourage gentleness. Others recommend a quick comment like my Mom ripped off a band-aid. 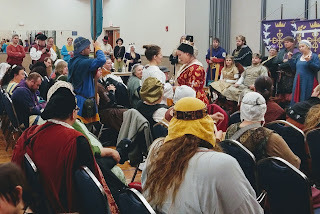 What is the best way to give constructive criticism or critique another scribe's work? I am no expert, but whether I am giving or receiving comments, I try to remember a critique is not criticism. It may include parts that are hard to hear or give, but it shouldn't bully, humiliate, or embarrass. It should include comments on what is well done and specific suggestions to improve. Lady Ismeralda, your scroll is beautiful. It looks like a lost page from the Luttrell Psalter. Even your colors are exact. Your black lettering will improve with more repetition. I love the unique grotesques you made from the recipient's cats. What do you think? Some critiques go better in private. I see this as encouraging Ismeralda's scribal work. It is not degrading. 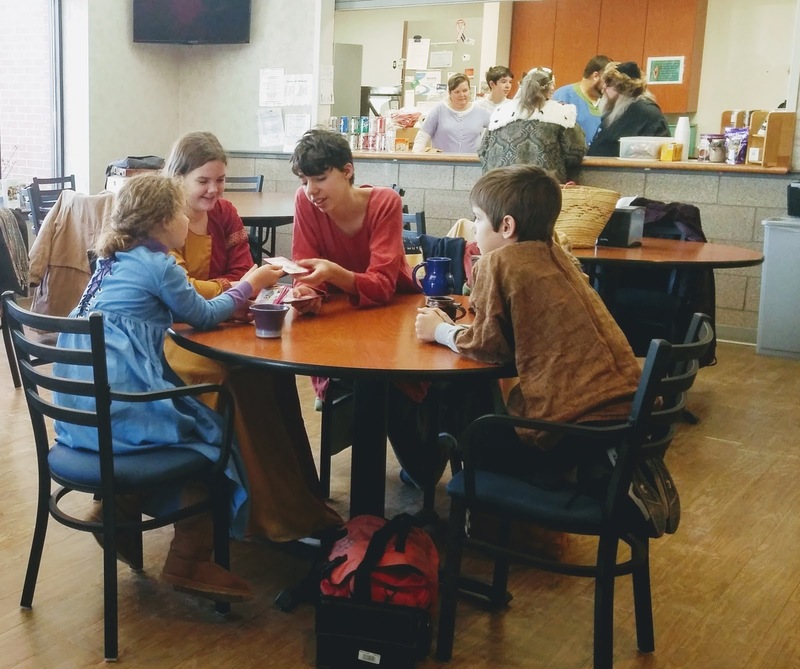 It gives her a specific practice without deploring her background or learning abilities, whatever her age. I see it as constructive. While conversations trade comments, critiques go better when requested. How do you ask when you want help? I prefer to ask several people their opinion, as each sees my work differently. And they may accomplish the same technique in different ways. I enter competitions to receive other's comments. Asking several people's opinions gives me options to try. It's even better when the "critics" are all together along with me and my work. When a scribe asks me about their work it helps if they ask about specific concerns. Maybe even pointing to what they mean on their scroll. If you are unsure why things don't look right to you, that is a fair question also. Posting a photo and asking an on-line group such as the SCA Scribes may work. However the art's image makes giving an opinion difficult or inaccurate. Also, you best information source may not want to comment on a permanent format other's read. Don't be shocked if comments are different than you expect. Some techniques are tricky. Take a second or third look. Ask how you can improve or what they recommend you try. A critique is meant to help. Let negative comments roll off. They will evaporate like morning dew. I still struggle with critiquing. If your viewpoint disagrees with mine, please, tell me why. I want to know the reason you want to do things differently. You may have found an easier way I don't know. A critique is only as beneficial as you make it. It takes trying the suggestions given. Progress takes your effort. Think positively. Revel in your skills. 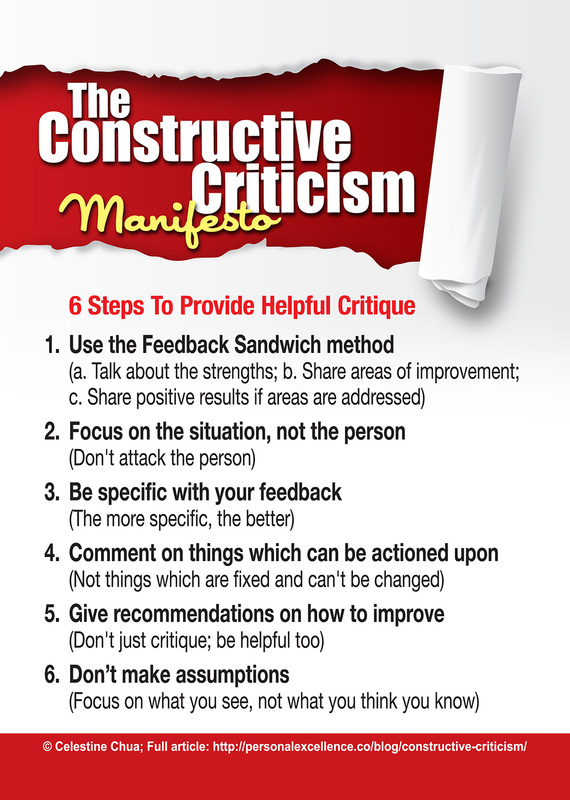 Constructive criticism is a useful tool for progress. A learning experience for the giver and receiver. Do You Steal...Like An Artist? I bought myself a present. I love the writer/artist Austin Kleon. He has a new book, Steal Like An Artist Journal. I'm flipping through the pages, seeing a little of everything. The first image I came across relates to scribes so well. Kleon describes simply the difference between plagiarism and creative repurposing. He calls it good theft and bad theft. And he compares the two. This is relevant for scribes because the way we create scrolls may come close to what he calls "Bad Theft". Bad theft to Kleon is stealing from one source, without any alteration or remixing. Or degrading the original work. I've come close to this myself. 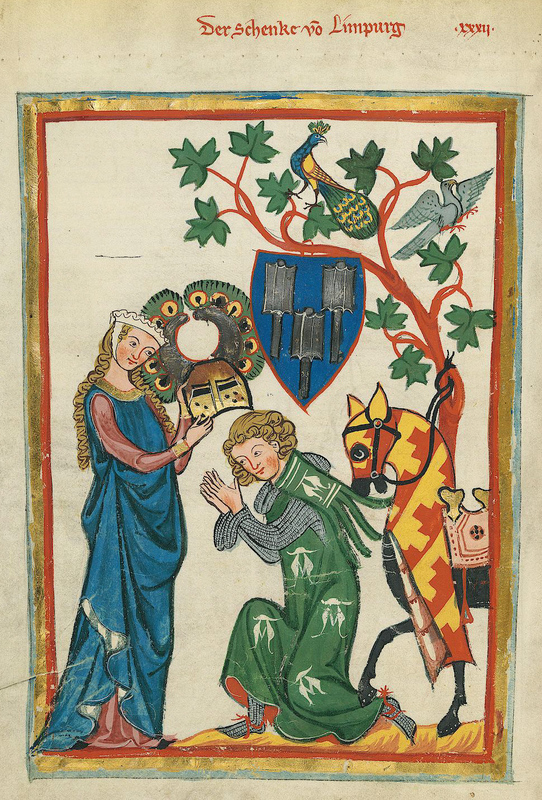 I love the Manesse Codex. As I've posted before, it's a leading reason why I became an illuminator. I changed the heraldry, used different materials, reversed the image, removed the frame, but its source is obvious. Sure the creators are long gone. Many are even unknown to researchers. And Wikimedia says on their file "attribution not legally required." The original creators won't know. But...the current manuscript holders should be credited. Some care because they use the manuscripts to make books they sell currently like The Getty does. It's their income. "Good Theft" isn't exactly theft. It's prompting you to create something new inspired by the works of others. You honor the originators' works by creating something well done in a similar manner to their art. You study their details and information, combining several motifs and remixing them to fit well together. Whatever the style, you transform them into something completely original and beautiful. Your job, then, becomes to collect good ideas. The more good ideas you collect, the more you can choose from to be influenced by. The more manuscript images you view the more motifs and inspirations you have within your head to remix into a new beautiful scroll. So, go on and steal like an artist. 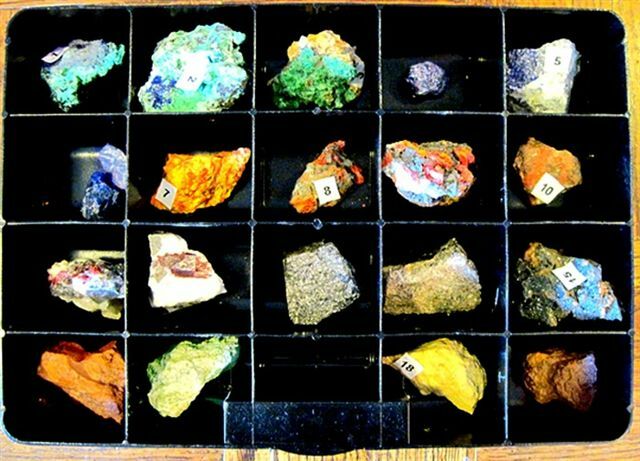 My rocks for paint collection. Every year this question pops up in the scribes guild, "Is gouache period?" I use it because it is more convenient than making paint from rocks and plants. I get favorable results, too. But, how Medieval is it? I have a tangled answer. Unfortunately, it is a lengthy story. To begin, the all-knowing Wikipedia reports the modern term "gouache" springs from "guazzo" a late period Italian word for mud. This referred to a late period practice of applying oil paint over a tempera base. That is a lot to take in, but there is more. A gouache painting is a watercolor done in opaque instead of transparent coloring; whites and pale tints are obtained by mixing titanium or Chinese [zinc] white with the colors instead of by utilizing the white of the ground. ... Gouache pigments are ground with a greater proportion of vehicle to pigment, and when they are painted out, the result is a continuous paint film of appreciable thickness rather than the thin wash or stain produced by watercolor. I don't own a copy of Mayer's book, but The Notebook is a searchable, update-able website for "understanding visual art references and resources", active since 1993. I'll take their word for it. So, what period sources describe adding chalk or blanc fixe to 'illumination' paints? Theophilus' On Divers Arts, written about 1122 is the oldest existing manual written by the artisan himself. The techniques he wanted to pass on were translated and annotated by John G. Hawthorne and Cyril Stanley Smith. Similarly, he also describes making a face highlighting pigment. He does this to make lighter colors to highlight clothing (p. 21) and to paint a rainbow. (pp. 23-25) Even though this is essentially a "gouache" its purpose is to make a tint. The tangle now comes because these descriptions may be written about icons and frescoes, not manuscript illumination. ... Rats! I find this intriguing. It is apparently the first written glimpse of an artist making an opaque paint to highlight manuscript illumination figures. 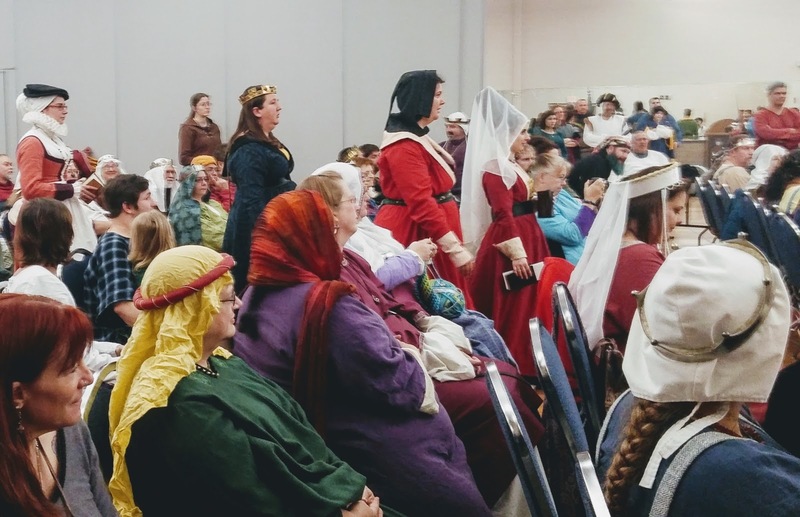 Those are amusing historical references, but debatable reasons for adding white to pigments. Take heart, I have found supporting 'gouache' evidence. There are recipes of a fillero being added during pigment production in the anonymously published 1596 English A Booke of Secrets. That sounds to me as if the chalk is optional. If it is optional, does that mean the color isn't changed by adding chalk? If it doesn't change it significantly then I think we've found evidence. The Booke of Secrets also provides two recipes for making Azure, one using white lead the other chalk. Take one ounce of white lead, nine ounces of Indicum, pour good vinegar into it, put them in a leaded dish, let them seeth well, and that which swimmeth on the top is the colour. Take two parts of chalk made of egshels, one part of Verdigreece, one part of Salarmoniacke, mingle them together with strong vinegar, put them in a new pot, stop it well, that no aire issue forth, set it in a warme place for a month long and it will be Azure. There is more to this story than I have written. It is well known lead white could not be used with verdigris and orpiment. What whiteners worked with them? How well did they work? What media were they used in? What colors were thick enough on their own to not need body added? 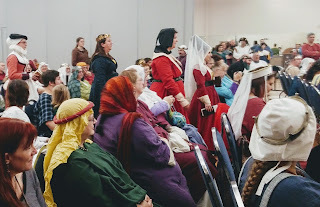 If you look into the whole Medieval whiteners' tangle you will find more questions than "Is gouache period?" The trick becomes finding the right question for the fascinating answer you have. Are you puzzled about paper? Even in this digital age it supports writing today, as it did in the past. Besides it has myriad other uses I'll avoid. I prefer to focus on the papers commonly used in the SCA. Paper selection for calligraphy is knotty. The best looking papers may be too slick and not have enough "tooth" to hold the ink. A good paper should be smooth for lettering yet lightly textured so your letters are clean and crisp. To decide which paper to use there are paper terms you'll want to know. Weight and caliper are good to know because thicker, heavier papers handle moisture better without buckling. Their measure also helps you compare options and brands. Weight (or technically basis weight) refers to the pounds a ream (500 sheets) weighs in its uncut size. For example, book paper is 25"x38". A ream of it weighing 70 pounds would be 70-lb. book paper. The same example metrically would weight 104 g/m2 or gsm. The sheet size is not the same for all paper types. Caliper is a paper's thickness measurement. Thicker, heavier papers might be measured in "points", abbreviated "pt". One point is 1/1000th of an inch. Cardstock might read "8-pt" if it is 0.008 inches thick. If you are a paper nerd and want to compare caliper and weight you can look that information up here. There's also this handy caliper to basis weight calculator. Both initially provided through paper information on Ian the Green's excellent blog Scribe Scribbeling. 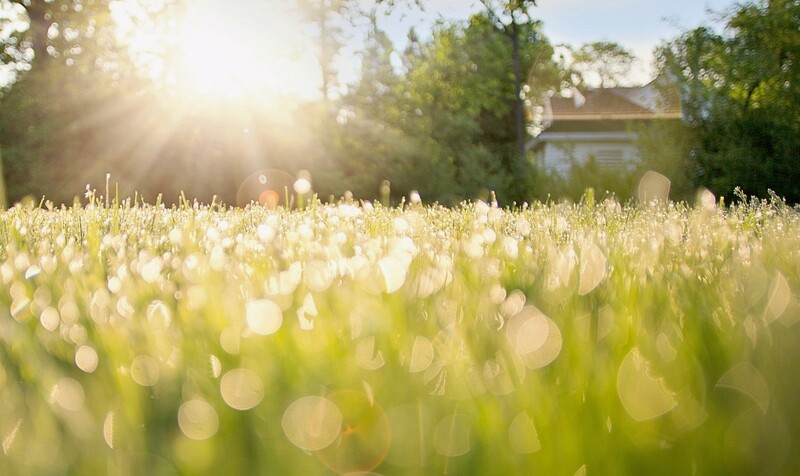 Brightness is the percent of light reflected from the paper's surface. Common copy paper has a 92 brightness. The higher the number the brighter the paper. Fiber refers to the paper's plant source. Whether cotton, linen, flax, jute, hemp, bamboo, rice straw, rattan or wood all provide cellulose to make thin mingled paper layers. The common fiber types for calligraphy, drawing and painting are cotton, cellulose or their combination. A paper's surface finish is its general texture, which affects how ink interacts with it. Common finishes are rough, coldpress, and hotpress. Hotpress paper is manufactured with heated rollers and is very smooth. It is commonly used for pen lettering. But, too glossy a finish causes ink to sit on the surface and possibly blob. A matte finish may not, but may be too rough--have too much tooth--for a broad nib pen. Grade refers to the paper's intended use. Bond paper is used for documents. Thicker common grades include Bristol and index. Sizing paper--not the paper's measured size--coats the paper to prevent moisture absorption. This reduces ink spread, feathering, and keeps your lines looking crisp. With huge paper options available, before starting a special project I consider the paper characteristics I want to have. 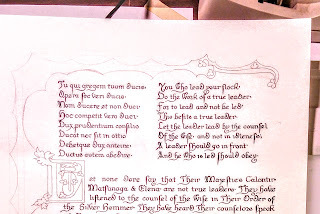 Without experimenting yourself, how do you know which paper is suitable for a scroll? There are a few tell-tale signs. I look closely for tiny protruding fibers that would catch my nib. I feel the surface to test the finish. You could buy a sheet to test the finish later, by sprinkling a waterdrop to see its absorption. Water stays on the surface longer when paper is well sized. You could ask other scribes or your kingdom's signet their preferences. That's a conversation starter in any scribal group. 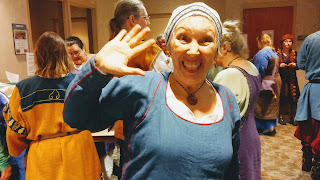 You might make a new scribal friend too. When your kingdom holds a scribal exhibit check out the displayed projects' supports. How does this affect your "paper" selection? When practicing calligraphy I want crisp writing so I truly see my or my students lettering results. I want a paper-ink combination that doesn't cause feathering, especially when using a cartridge pen. Here are two options to try for "practice". Rhodia makes 80 gsm paper pads that are blank, ruled or graphed. I love the fun little orange 3"x4" graph pads to carry with a marker for practice, perfect for waiting at the podiatrist office. Here is a video by Dan Nelson explaining paper choices. You can write on most paper that is compatible with your chosen ink. Experiment...Some inks bleed on more papers than others. When I first started painting illuminations I used watercolor paper. I still have the same pad I used for this. Watercolor paper, even without calligraphy, is too rough and matte. You can tell that from this picture when you click it to enlarge. The next paper I used was Bristol board. I still occasionally use it. 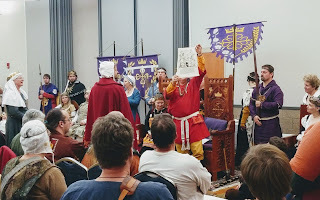 For SCA scrolls, calligraphy or illumination, it is economical and practical. It can be corrected by carefully scraping the surface, but it is tricky. It is produced in sheets and pads by many companies in various weights. I use the smooth surface Strathmore 300 series weight. The vellum surface Bristol has a texture not suited to calligraphy. Strathmore 300 series smooth Bristol paper is an economical, 2-ply, 270 gsm/100 lb acid-free paper. For scribal classes, I use printer friendly card cardstock. This allows me to print out a ductus or script with a grid for student's practice. Most student lettering appears crisp on white cardstock. Cardstock is also used for Calontir preprint awards. Pergamenata is my favorite support. 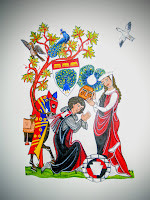 It is easy to paint or letter and feels like working animal parchment. You can correc it easily using the period scraping method. 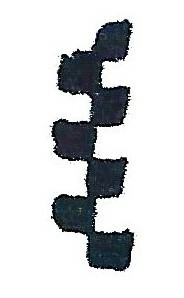 Recent Iren-hirth scroll on pergamenata. Pergamenata is a 100% cellulose product with a mottled, parchment look. It is made in Italy in white or natural colors, in 160 gsm and the heavier 230 gsm. It is ph neutral. I've bought full and 11"x14" sizes, heavy and light weight at John Neal Bookseller. You can also find it at Paper & Ink Arts. 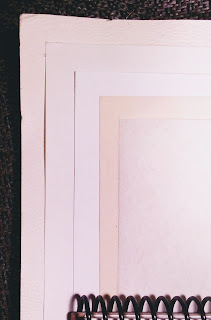 Tip...Because scribes work with gouache directly from the tube--as apposed to watercolorist's washes--heavier paper reduces gouache cracking. Be cautious when shopping. It's easy to confuse terms online or in the store. 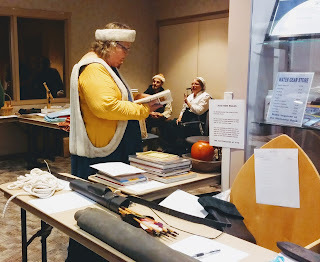 Historically and today, both vellum and parchment refer to an animal skin writing support. Shopping at office supply stores or online you will see both terms referring to paper types, not animal skin. The term may refer to the paper's surface texture or its translucence. They are also sold for modern calligraphy. There's a very thin paper called European Parchment that comes in a color called "Pergamenta Ivory". It is described on Amazon as a "cloud-like translucent, Ivory parchment paper." It may be great for certificates and have been used for centuries as described. It is not an animal skin, nor is it the 160 gsm or 230 gsm pergamenata used for scrolls by scribes in the SCA. Believe it or not, this is a light-weight post about paper. 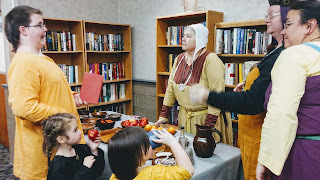 There's more you can discover, like how it was made in the Middle Ages, removing mistakes, or how to stretch it. Hopefully, this post untangled your paper purchasing puzzle. 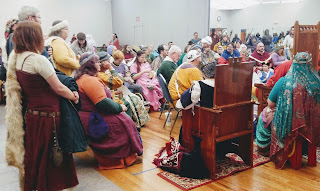 Yesterday, I joined with many others to celebrate 12th Night in the Barony of the Lonely Tower. These winter festivities extend my New Year's celebrations a week and enliven my dreary winter. 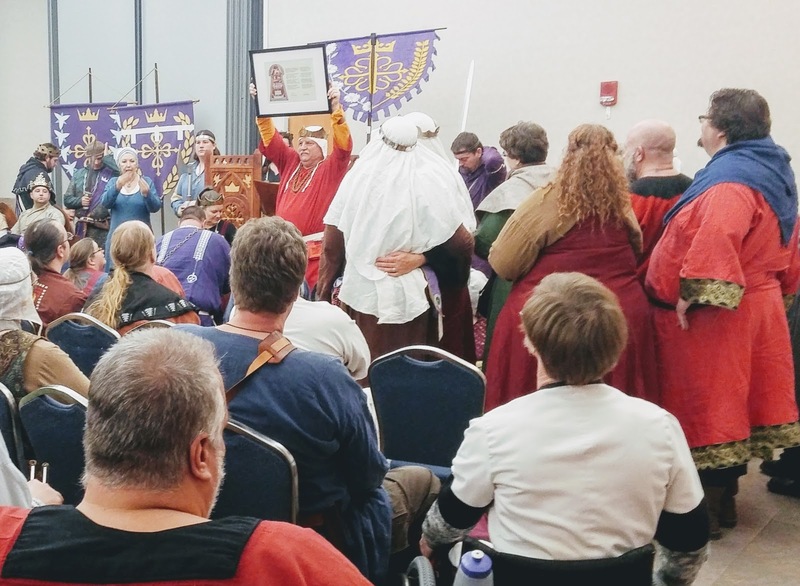 This annual event jump starts Calontir's event calendar, with its striking armored combat and steel fighting challenges. Populace watching the two fighting list fields. In Calontir the process to becoming a peer includes "sitting vigil". The candidate has a private space to receive visitors who provide counsel and comment. While waiting guests partake of wonderful and exotic foods. There's also time to chat and work on projects. 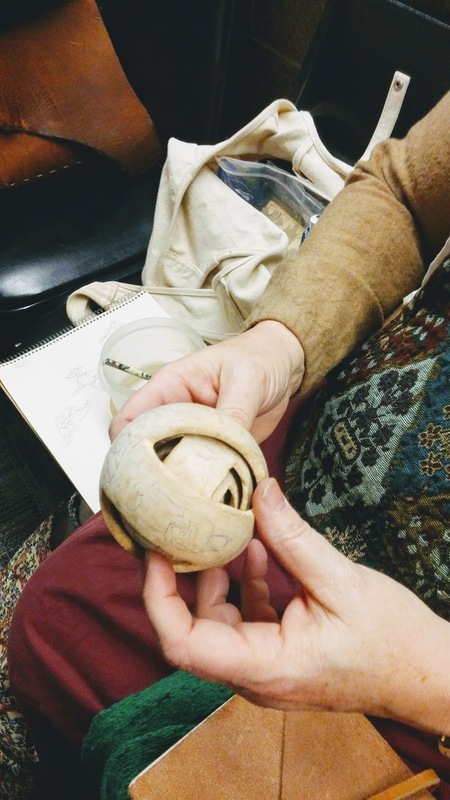 HL Natalya is carving a multilayered wood ball. She's separated the layers and is carving each one. Along with the project among other things she has researched who would have owned this, how it would be commissioned, and the symbols it would include. She enjoys researching the back story for each project she makes. This year's focus was Italian Renaissance to celebrate Baroness Giulia's birthday. 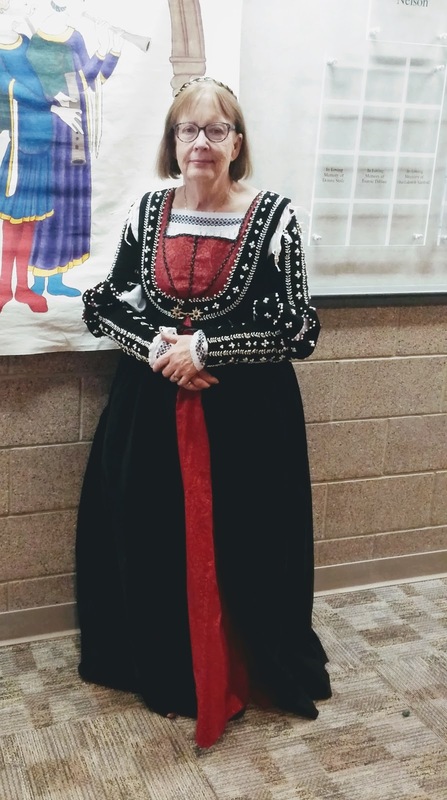 I even dug out my Italian Renaissance garb and had Lady Christine take my picture. Fighting isn't the only activity. There are delights for all Calontir's warmhearted, non-fighting populace. 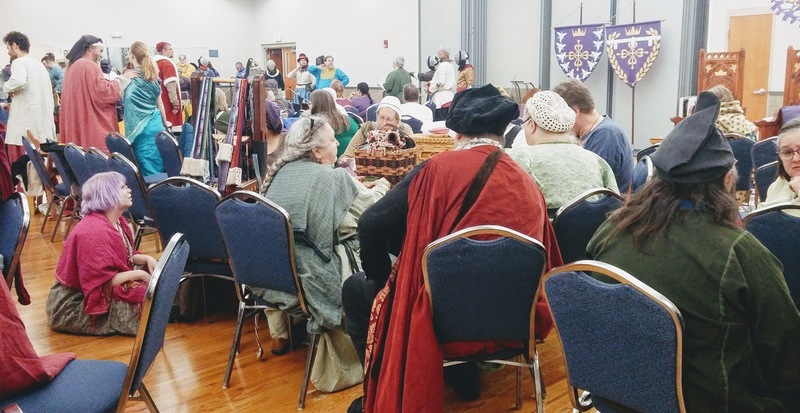 Looks like the Fiber Guild found a place to meet. 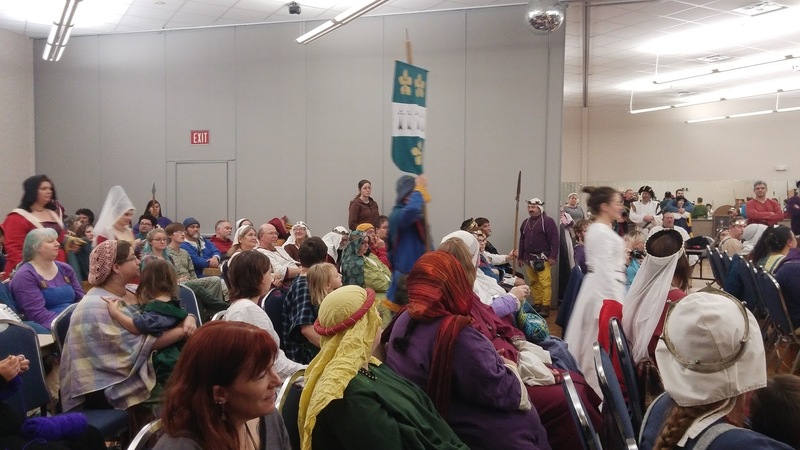 The Barony held three Arts and Sciences competitions. 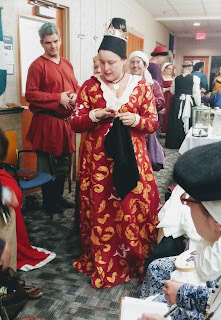 1350+ Italian States Decadence Table: – Held in Honor of our wonderful Baroness Guilia’s Birthday. beverages and ended up working; Clare made the tasty home-baked bread; Roise provided supplies, extra food, soda, and advice. Alex and Tigernan provided muscles for lugging and hauling things. 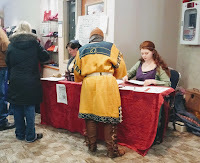 B. Juliane, HL Clare, and L. Sammthan ably organized and staffed the silent auction donation multitude. 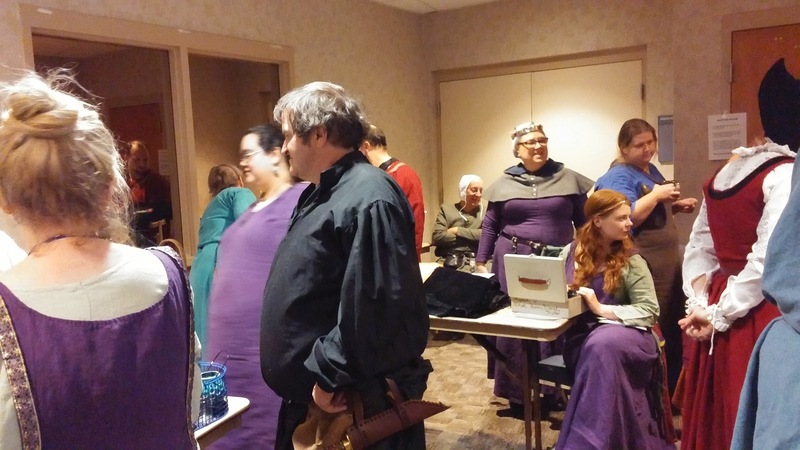 The Lilies War Committee held a well-attended meeting to plan the coming annual June event. 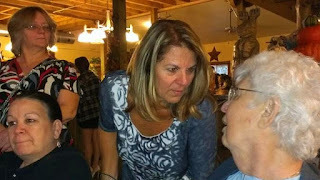 There was much to discuss. After lunch at the inn things wound down preparing for the coming court. I spent time counting money with L. Alit the Exchequer. People finished off vigil food. 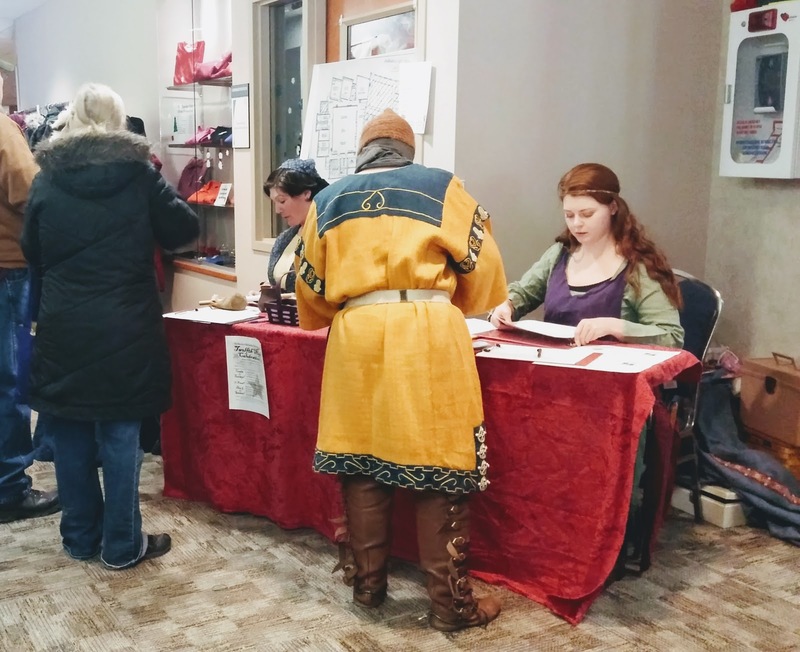 Paid for their silent auction items. M. Nesccia and some silliness. I alway love court. 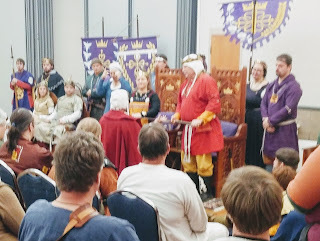 Today's was special because two loved Calontiri were taken into peerage Orders. 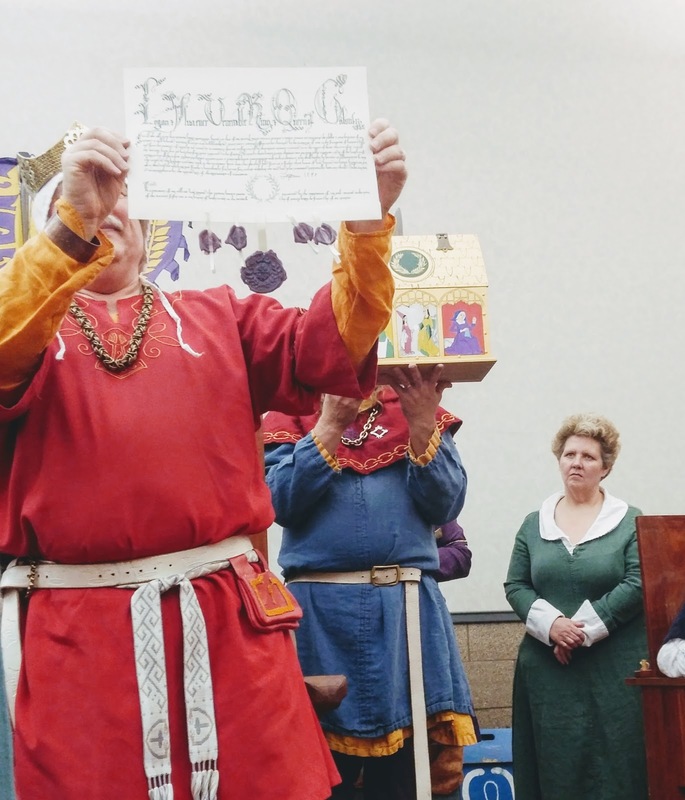 Their Majesties also share notes of silliness, comment and announcements. I wish you could enjoy them there with me, but my few pictures will have to do. Catrijn vanden Westhende's Peerage Processional. 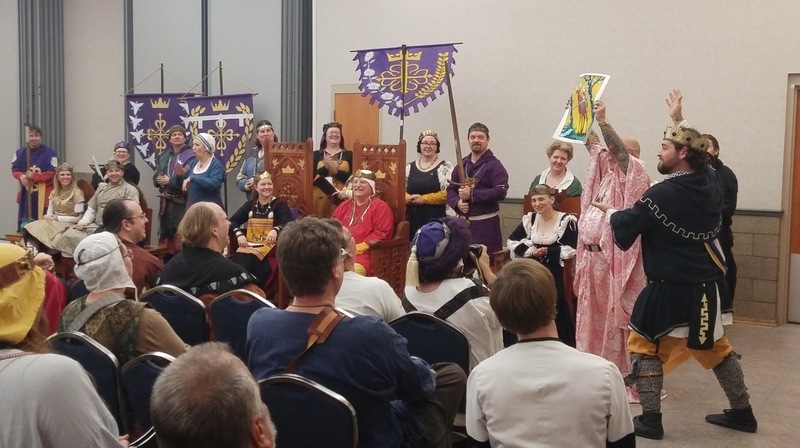 The writ making Catrijn a Laurel. 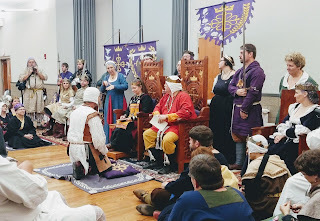 Count Sir Volkmar kneeling during his Pelican ceremony. His Majesty displaying Volkmar's Pelican scroll for all to see.